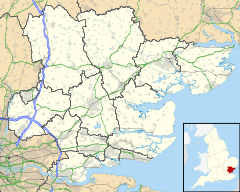 For ither uises, see Colchester (disambiguation). Colchester i/ˈkoʊltʃɛstər/ is an heestoric toun an the lairgest dounset within the borough o Colchester in Essex, Ingland. ↑ "Oxford English Dictionary Gateway". Dictionary.oed.com. Retrieved 2012-06-28. ↑ 2.0 2.1 2.2 2.3 Francis, Valerie. "Twin Town News - Colchester, Avignon, Imola and Wetzlar" (PDF). The Colchester Twinning Society. Retrieved 2013-07-22. ↑ "British towns twinned with French towns [via WaybackMachine.com]". Archant Community Media Ltd. Retrieved 2013-07-12. This page wis last eeditit on 19 Juin 2017, at 23:56.